Introduction: The full name of Rajiv Gandhi was Rajiv ratna Gandhi. Mr. Rajiv Gandhi was the youngest Prime Minister of India. He was born on 20th August 1944 in Mumbai. He was the grandson of Pandit Jawaharlal Nehru. 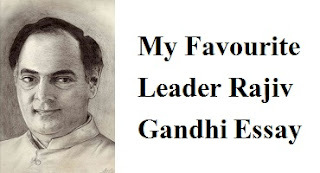 Mr. Rajiv Gandhi learnt a lot from his grandfather and his mother Mrs. Indira Gandhi. Mr. Rajiv Gandhi was educated at Dehradun. He was bold and brave even in his childhood. He studied at Dehradun between 1955 and 1960. After passing senior Cambridge examination, he went to England for college education. Trainee Pilot: When Pandit Nehru died in 1964, Mr. Rajiv Gandhi had been undergoing training for being a pilot. When he was 24, He met Sonia Gandhi, now the president of the Indian National Congress. He married her on 24th February 1968 Mr. Rajiv Gandhi joined the Delhi Flying Club and he became the pilot in the Indian Airlines in 1970. As a pilot: Mr. Rajiv Gandhi was happy as a pilot and he did not like to join politics. Even after his younger brother, Sanjay Gandhi was elected member of the Parliament, Rajiv Gandhi remained a pilot. On June 23, 1980 Sanjay died in air crash. As a politician: In the changed situation, Mr. Rajiv Gandhi had to jump into politics. He was elected MP from Amethi and he was appointed General Secretary of the Congress Party. After Mrs. Indira Gandhi's death on 31st October 1984, he became Prime Minister. When he faced the general elections in December 1984, the Congress Party under his leadership secured 401 seats out of 508. Thus at the age of 40, he was elected prime minister on 31st December 1984. Problem faced by Rajiv Gandhi: Mr. Gandhi had to face a number of problems soon after he became the Prime Minister. But he took some bold steps to solve them. He started the 200 point economic programme of the late Mrs. Indira Gandhi to eradicate poverty. He decided to work for the welfare of women and children. In the field of education, he wanted to bring the country into 21st century. So he gave importance to the development of Science and Technology. Mr. Rajiv Gandhi had been trying hard to run clean government. His achievements: Mr. Rajiv Gandhi had some notable achievements to his credit. He started dialogues with the people hostile to peace. He signed the Punjab Accord in order to bring about peace in the state. He signed the Assam Accord and held elections in the state. He tried to establish peace in Nagaland and Mizoram. Conclusion: He followed the policy of peace, non-alignment and friendship in the world. He tried to solve the Tamil problem in Sri Lanka. His aim was to have good relations with our neighbours. In fact, he had been the hope of the people. The hope remained unfulfilled. Mr. Rajiv Gandhi was killed on 21st May, 1991. At the time, he was near Chennai during his election campaign. His life is a glorious example of boldness and greatness.